My review of Felix Gilman's 2010 novel The Half-Made World concluded without a conclusion. Like its setting, The Half-Made World felt half-made, the first half of a story whose conclusion—or even, it sometimes seemed, whose beginning—Gilman was determined to defer. It probably shouldn't come as a surprise, therefore, that The Half-Made World 's sequel The Rise of Ransom City declines, with equal deliberation, to deliver that conclusion. In fact, it skips over the story that we might have expected to be both novels' business, and instead focuses on another story in its margins. The result, as it was in The Half-Made World , is one of the most unexpectedly delightful works of fantasy published in the last few years, but it's also one that suffers from some of the same problems that marred my enjoyment of its prequel. The Half-Made World introduced an alternate version of American Western expansion that was half Weird West, half extended metaphor. In that world, the further one travels into the unexplored, unpopulated West, the less solid it becomes. Science gives way to magic, the laws of nature become mutable and eventually cease to matter, the very ground beneath your feet becomes untrustworthy. It's only human settlement that solidifies this landscape, makes it rational and predictable. (Readers who have not read The Half-Made World or my review of it will now be wondering where this scheme leaves Native Americans. Their analogues in Gilman's world are The Folk, who are described as part of the unmade world's magical nature to the extent of being inhuman—they die and come back to life, for example. This is, obviously, a very problematic approach, as we will discuss later in this review.) In the course of their exploration and excavation of the half-made world, humans unleash—or perhaps create, through the combination of ambient magic and their thoughts and desires—two demons, the Line and the Gun, representing unbridled industry and lawlessness, respectively. Three characters—Dr. Liv Alverhuysen, a psychologist from the civilized, solid East who travels to a frontier hospital; John Creedmoor, an Agent of the Gun, granted strength, longevity, and healing powers in exchange for carrying out his masters' vile schemes; and Sub-Invigilator (Third) Lowry, an officer of the Line's forces—converge in their pursuit of General Orlan Enver, the leader of a failed attempt to bring a third force, democracy and the rule of law, to the half-made world, whose mind has been shattered by the Line's weapons, but who may still possess the secret to a Folk weapon that could destroy the Line and the Gun once and for all, and end the war. The Half-Made World was dominated, and sometimes overpowered, by a sense of claustrophobia. Its characters were trapped—Creedmoor and Lowry by masters they despised, whose orders stifled their humanity, but whom they dared not disobey, and Liv, who had spent a lifetime doing the done, expected thing, by uncertainty and dissatisfaction with the paths laid before her. As they became embroiled in the most decisive moment of the war, the sense that our heroes had only limited and unsatisfying options increased to an almost unbearable pitch. What's more, the half-made world itself felt like a suffocating trap. You could either have your humanity stamped out by the Line, live in terror of the Gun's violence, or try (and usually fail) to live up to the rigid, joyless ideals of General Enver's Red Valley Republic. At the novel's end, however, Lowry has died, and Liv and Creedmoor (who has renounced the Gun's service) have learned the General's secret. In The Rise of Ransom City , therefore, one might expect these characters to break free of the shackles of hopelessness and limited choices, embracing the power of the Folk's weapon, and becoming players on an equal footing with the Line and the Gun. Instead, that story—or some less mythical, less romantic version of it—takes place in the novel's background and its margins. What's more, both of the novel's narrators—self-proclaimed "Professor" Harry Ransom, who is writing several years after the war, and renowned journalist and author Elmer Marriel Carson, who has spent decades compiling Ransom's writings, and who interjects with forewords and footnotes in which he casts doubt on the accuracy of Ransom's version of events—take it as a given that their readers know how things turned out for Liv, Creedmoor, and the war, and are writing to shed light on some little-known aspects of that story. That the resulting story is nevertheless lively and energetic is down to Harry himself. His narrative is a picaresque, which sees him from small towns to the big city, taking odd jobs on riverboats and in theaters, being fêted as a hero and forced to collaborate with the Line. It's also, however, frequently a narrative of loss and disappointment. Harry loses everything—including friends, lovers, and family—several times over, and his autobiography is primarily an apologia to a world that holds him responsible for some of the Line's worst excesses ("I was a victim of circumstance" (p. 19), he explains in his narrative's opening sentences, which is both self-serving and accurate). Not for Harry Ransom, however, the kind of hopelessness that permeated The Half-Made World . Harry is that quintessential figure of the narrative of Western expansion, the man who travels West to stake out his place in the world and make it his own, remaking himself in the process. Depending on how you look at him, Harry is a huckster, a snake-oil salesman, an entrepreneur, or a holy fool, but either way he is filled with optimism and the certainty of the bright future that awaits him. Inspired by the autobiography of his idol, the business magnate Alfred Baxter, Harry is full of ideas about pulling himself up by his bootstraps, seizing the reins of history, and succeeding through hard work and initiative. There is no more profound measure of his character—and of the shift in tone between The Half-Made World and The Rise of Ransom City —than the fact that despite being disappointed in so many of his hopes and beliefs, in the character of Mr. Baxter, and in his own ability to control his life and environment, when he sits down to put pen to paper (or rather, when he sits down to his typewriter, a machine whose innovativeness never ceases to impress him), Harry remains convinced of the capacity of the Western frontier to to give humans more ways of living their lives than the limited options presented in The Half-Made World . The first thing he produces is yet another dream of success, an invitation to his readers to join him in building Ransom City, "THE CITY OF THE FUTURE" (p. 302). Where Liv, Creedmoor, and Lowry viewed the Line and the Gun with almost superstitious dread, Harry sees them (or rather, the Line—despite their insistence that the conflict between the two forces is so evenly matched that it has been raging for centuries, both novels do more to establish the menace and danger of the Line than the Gun, stressing its dehumanizing effect on the towns and people it conquers) in mundane, albeit no less dangerous terms. If in The Half-Made World the Line was a sort of storybook monster—when Liv describes an engine of the Line, she does so only obliquely, implying that it was too terrible for her mind to grasp—what it is to Harry is a grasping, ever expanding business concern, grinding people in its path and turning them into faceless cogs in the machine of its expansion. He tells us how it drove a rival mine owner out of business in his hometown, how his father was crippled by debts to the Line that he could never repay. Through Harry's eyes, we see the Line's evil as hyper-capitalism, which stands in such stark contrast to his belief in entrepreneurialism, in the power of the individual to remake the world through business and hard work, that it becomes anathema to his very worldview. 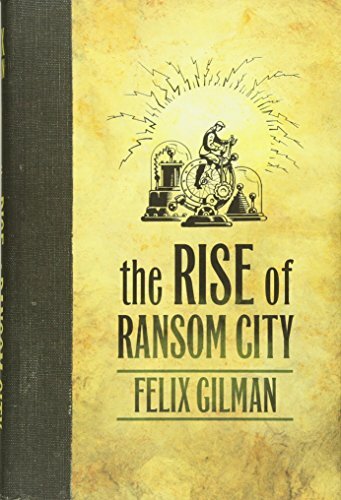 It is perhaps Gilman's most impressive accomplishment in both of these novels that despite telling such different stories, in such different tones, and with such different protagonists and settings, one never feels any difficulty in believing that The Half-Made World and The Rise of Ransom City take place in the same world. Partly this is down to Gilman's detailed worldbuilding, which draws from reality (right down to a fantasy world equivalent to the Cumberland Gap, which in our reality gave European settlers access to regions beyond the Appalachian mountains) but always with a fantastic twist. Just as important, however, is the sense of strangeness and irrationality that underpins both novels. So pervasive is Harry's loquaciousness and fondness for detail, especially after Liv and Creedmoor's stunned, uncomprehending view of their surroundings in The Half-Made World (the second half of which takes place in the unmade lands, where the irrationality of everything they encounter leaves the characters speechless), that it takes a while to realize that there is something that he, too, is eliding. Why, for example, should Harry take the Northern Lighting Corporation's ugly, cold light as "a personal insult"? What Harry is failing to describe, perhaps because it defies description, is The Ransom Process, a system of lighting that is half science, half magic. Harry tells us a great deal about the Process and its quirks and dangers—"The process is everywhere at once . . . Like gravity, or time. It occurs simultaneously, without wires" ( ibid ), "once the first spark was roused it worked in perpetuity, feeding only on itself . . . it created heat as well as light" (p. 53), "when the Process starts to run wild it plays tricks with Gravity" (p. 54)—but the effect of each of these revelations, separately and cumulatively, is only to make the Process seem more impossible and indefinable. They most certainly don't tell us how a small-town inventor came upon a working, magical perpetual motion machine. Throughout The Rise of Ransom City Harry slowly teases out the truth about how he "invented" the Process—unsurprisingly, the Folk turn out to be involved—but, like the weapon that drives The Half-Made World 's plot, it remains an ineffable blank spot at the center of the novel. When Harry's path crosses Liv and Creedmoor's and he ends up using the Process to save them from another Agent of the Gun, his dreams of giving the world abundant free energy are perverted into a weapon that, as in The Half-Made World , both the Line, the Gun, and those seeking to destroy them are desperate to get their hands on. An oblivious Harry makes his way to the teeming metropolis Jasper City, hoping to rebuild his Apparatus and form a partnership with Mr. Baxter, only to find himself first embraced as a folk hero and the city's future savior, and then suborned into becoming the Line's spokesperson, all while the war rages outside the city, as Harry tells us in the snippets he discovers of Liv, Creedmoor, and the resurrected Red Valley Republic's progress. (One of the unfortunate effects of this device is that it flattens the previous novel's characters. While Creedmoor remains much as he ever was—when he tells Harry that he has left the Gun's service, Harry muses that "He said that last thing like it was not so difficult to do for a man of his quality, like he wanted me to be impressed by his daring" (p. 97)—Liv, who in The Half-Made World was an intriguing blend of principle, selfishness, and short-sightedness, is here reduced to a saintly figure, both in Harry's reminiscences and in the folk figure that coalesces around her.) By the end of the novel, Harry is as trapped as Liv and Creedmoor ever felt, and with a great deal less to show for his ordeals. "I never said that this would be a story of triumph," he tells us. "For the most part it is not" (p. 149). In a way, Harry and Carson's expectation that their readers know how the war turned out can be extended to The Half-Made World 's readers—both history and the tropes of fantasy tell us the kind of story we can expect. We know how the epic fantasy narrative of plucky nobodies defeating a supernatural menace goes, and we also know that these heroes, though adept at facing up to the inhuman, often find themselves helpless in the face of mundane human politics and greed. Gilman's choice to avoid telling that story, instead concentrating on a new character whose dreams and aspirations are by no means guaranteed any particular resolution, is a wise one. The purpose of the novel turns out not to be the narrative of how the Line and Gun were defeated—a triumph that, from the snippets we hear of it, is depressingly mundane. As Harry discovers when he meets Liv near the end of the novel, far from seizing the reins of history, she has become estranged from Creedmoor and pushed out of the revived Red Valley Republic's inner circle. Instead, what Gilman is stressing is the fact that, despite these disappointments and the repeated proof of its impossibility, characters like Harry will always look at the half-made world and see the chance to make their dreams come true, to build a world free of human frailty and cruelty, where light and heat are free for all. If I find myself, for all that I enjoyed it, somewhat hesitant to put my unqualified stamp of approval on The Rise of Ransom City , it is because there is yet another story in the novel's, and its prequel's, background that Gilman has chosen not to tell. I am referring, of course, to the Folk, who in both The Half-Made World and The Rise of Ransom City are implied to be either pulling strings behind the scenes (they try to manipulate Liv and Creedmoor into learning General Enver's secret) or scrambling to control the effects of humanity's blundering through the half-made world (as the Folk see it, Harry has stolen the Ransom Process, and they dispatch one of their kind—whom Harry knows as Mr. Carver—to observe him and it; the character briefly serves to give the Folk a face and a voice, but as seen through Harry's eyes he is taciturn and mysterious, and disappears shortly into the novel). There is, it is clearly implied in both novels, another version of their story, in which the war ends through the Folk's interference, even though all they get from doing so is dispossession, slavery, and death. That Gilman chooses not to tell that story—that in the scheme of the world he's created it may not even be possible to tell that story, because the Folk are natives of the irrational, unmade world and thus can't be captured in narrative or even words—is sadly in line with the way the narrative of Western expansion has elided the stories, the existence, and even the humanity of Native Americans. One of the reasons that I felt unable to render a definitive judgment in my review of The Half-Made World was that it wasn't clear to me whether Gilman intended to complicate that novel's take on the Folk as inhuman and to give them a voice. As much as I enjoyed The Rise of Ransom City —and as much as I wish that I could herald this duology as the major work that, in many other respects, it most certainly is—I can't ignore the fact that he has not done so.